Ballots for the August primary began going out to registered voters Wednesday. Washington state voters will notice something different about their ballots that began going out Wednesday for August’s primary election — for the first time ever, all of the state’s 39 counties are including return envelopes with prepaid postage. The decision to save all state voters the cost of a postage stamp was made reluctantly this spring by Gov. Jay Inslee after King County, the state’s most populous, decided it would move ahead with its own prepaid-postage plan regardless of what the rest of the state was doing. The Metropolitan King County Council adopted a request in May for $381,000 by King County Elections Director Julie Wise to pay for prepaid postage in this year’s primary and general election. Secretary of State Kim Wyman urged the council to wait so the state could make the change at the same time. When that didn’t happen, Wyman made an emergency request to Inslee for $2 million. 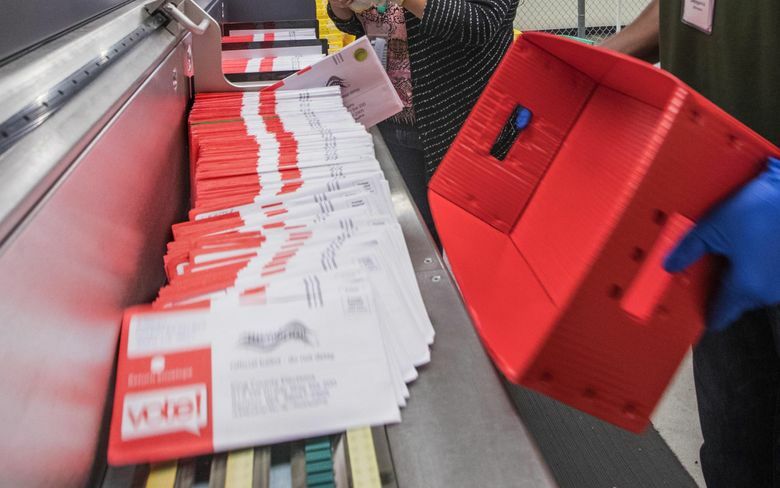 Wyman’s and Inslee’s decision to go forward with prepaid postage came late on the calendar for county election officials, some of whom had already ordered their primary envelopes and ballots. Wyman said the response from the counties has been varied and frustrated. “It just goes to show that election decisions like this need to be made statewide,” she said. Still, every county has figured out how to get it done, although there are slight differences in how each is approaching the August primary. Ferry, Columbia and Wahkiakum counties discovered it was cheaper to affix first-class mail stamps to ballot envelopes, while the other 36 counties are using business reply postage. Wise, with King County, wanted to move on prepaid postage after a test run in three special elections last year showed positive results. In Shoreline there was a 10 percent increase in voter turnout, while Vashon Island and Maple Valley had an increase of 6 percent. The percentage of voters returning ballots by mail also increased in the three special elections to 70 percent. Normally ballots are returned in nearly even numbers between drop boxes and the mail, Wise said. Wise is predicting a 40 percent turnout in King County for the midterm primary, which would be a 10 percent increase over 2014, the last midterm without a presidential election. The general election in 2014 saw 55 percent of registered voters return ballots in King County. For the state, 31 percent of voters returned ballots in the 2014 primary and 54 percent in the general. Wise is pleased the entire state is participating regardless of the funding controversy. She and Wyman both said they are eager to see how prepaid postage affects voters and to gather data that can be used in Olympia to make the funding regular for elections. Sens. Joe Fain, R-Auburn, and Mark Mullet, D-Issaquah, plan to introduce a prepaid-postage bill next session. Wyman believes this year’s election-turnout numbers can be used to spark a discussion in the Legislature about the state paying its share of election costs. Currently the state only pays during odd-year elections. “The real meat of the discussion is that the state should pay their fair share of the election,” Wyman said.